Edinburgh Monarchs got their Premier League campaign off to a winning start against Workington Comets at Armadale Stadium last night. Monarchs triumphed 49-41 after trailing by six points in a nervy opening period. The Comets looked far more assertive but ultimately could not maintain their strong start to the meeting. But they will seek swift revenge in tonight’s return clash at Derwent Park. Monarchs skipper Sam Masters admitted the Comets made it hard at times for the home riders, but said: “We have to be pleased with the result after trailing by six points early on. 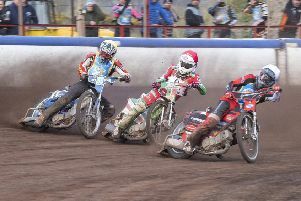 Workington made it difficult at times, especially out of the starts. The first half of the meeting proved to be something of a rollercoaster for Monarchs as Workington grabbed the lead in the very first race when Ricky Wells and Rasmus Jensen grabbed a 4-2 over skipper Sam Masters and Erik Riss. And when the Comets repeated the trick in the second race to lead 8-4, Monarchs knew they were in for a battle royal against their Cumbrian visitors who have not enjoyed the best of fortunes at the Lothian Arena in recent times. Ryan Fisher and Dan Bewley pinched a 4-2 in the fourth race to leave Monarchs trailing by just two points, but the home side were stunned in heat five when Comets duo Wells and Jensen raced to a 5-1 against Kevin Wolbert and Jye Etheridge to open up a six point gap, 18-12. But Monarchs hit back with a 5-1 of their own in heat six courtesy of Riss and Masters to reduce the leeway to two points again. And a 4-2 from Fisher and Max Clegg in heat seven pulled Monarchs level 21-21. Monarchs then took the lead for the first time in heat ten when Masters and Riss rode to a splendid 5-1 over Kenneth Hansen and Mason Campton to leave the Comets trailing 32-28. Monarchs moved up a gear now and a brace of 4-2 advantages in heats 12 and 13 moved them eight points in front, 43-35 and the Comets appeared to have run out of steam a little after their first-half power show. Monarchs, whose top four all scored well, closed out the match by sharing the final two races, and the Capital outfit will be mighty relieved to start the defence of their championship with a victory especially after the Comets gave them something of a scare to begin with. Old heads Masters and Fisher brought their experience to bear when it mattered most, but Riss once again displayed his potential with a handy eight-point haul underlining just how pivotal a performer the young German could prove to be over the course of the season. Comets top scorer was American ace Wells who stormed to 13 points. Monarchs: Masters 12, Fisher 11, Wolbert 9, Riss 8, Clegg 7, Etheridge 1, Bewley 1. Workington: Wells 13, Hansen 7, Jensen 6, Vissing 6, Williamson 5, Campton 3, Roynon 1.